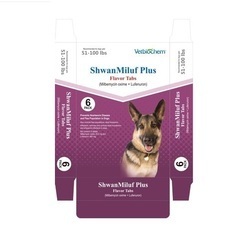 Our product range includes a wide range of fast tab medicines, fast tab ( nitenpyram 57 mg ), troncil tab, shwan spot on for medium dogs, shwanmiluf plus and shwanfipro plus spot on. 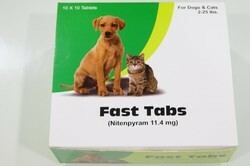 A single dose of Fast Tabs should kill the adult fleas on your pet . If your pet gets re - infested with fleas , you can safely give another dose as often as once per day . Fast tab begin working within 30 minutes . 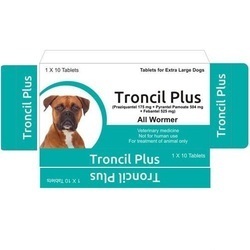 It may be used together with other products including heartworm preventives, corticosteroids, antibiotics, vaccine, deworming medications, shampoo and other flea products. Store at less than or equal to 25 degree C .
It kills adult fleas that cause flea allergy dermatitis . Storage : Store at less than or equal to 250C . 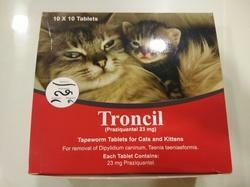 Indication: For removal of Dipylidium caninum , Taenia taeniaeformis . 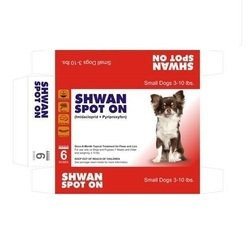 Prevents flea on treated dogs . To ensure adequate absorption . Its important to treat all the dogs in the households for fleas . It must be administered monthly . Treatment may begin at any time of year . 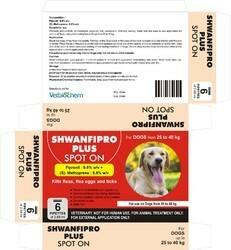 SHWANFIPRO PLUS provides fast, effective and convenient treatment and control of fleas, ticks and chewing lice. 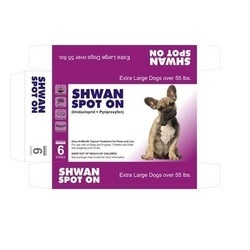 SHWANFIPRO PLUS has a rapid onset of action and kills re-infections with newly acquired adult fleas for at least one month. 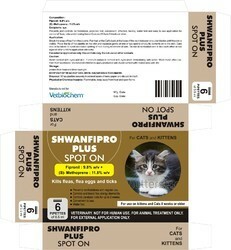 SHWANFIPRO PLUS also prevents the development of flea eggs, larvae and pupae produced by adult fleas acquired for six weeks after treatment. 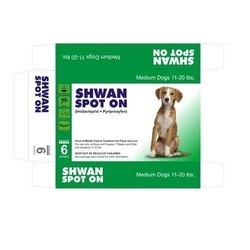 SHWANFIPRO PLUS may be used for the treatment and control of Flea Allergy Dermatitis. 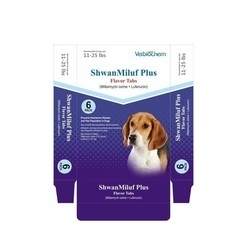 SHWANFIPRO PLUS is used for flea control as it breaks the life cycle and in its surrounding by killing all stages of fleas. Treatment and prevention of flea infestation (CtenocephaIides spp) and control of brown ticks (Rhipicephalus sanguineus), paralysis tick (Ixodes holocyclus) and biting lice (Trichodectes canis). 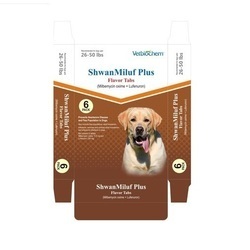 SHWANFIPRO PLUS also prevents the development of flea eggs, larvae and pupae produced by adult fleas acquired for three months after treatment. 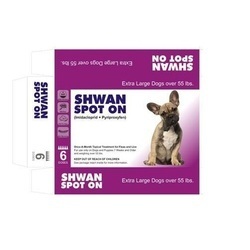 SHWANFIPRO PLUS controls brown ticks for up to one month and paralysis ticks for up to two weeks after application. Daily searching is necessary to minimize the risk of tick paralysis. Searching should continue throughout the paralysis tick season. 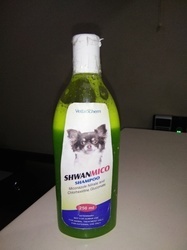 Topical keratolytic, antibacterial, antifungal, antipruritic shampoo for Pet. For the treatment of seborrhoeic dermatitis associated with infections by Staphylococcus intermedius, Malassezia( pityrosporum ) , pachydermatous and aids in the treatment of dermatophyte infections due to Microsporum Canis, Microsporum gypseum and Trichophyton mentagrophytes in Pet. Properties: It is formulated to remove scale, decrease the skin and kill cutaneous microorganisms which primarily or secondarily cause dermatitis. Wet the pet thoroughly with clean water. Apply shampoo to the Pet at several points and massage into the coat . Ensure that Shwanmico shampoo is applied around the lips , under the tail and between the toes as these areas harbour causative organism . Allow to stand for 10 minutes , then rinse off with clean water . Repeat twice weekly until symptoms abate or as directed by your Veterinarian . 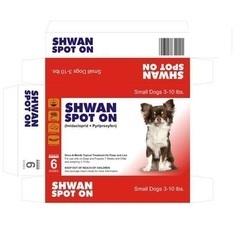 For the prevention and treatment of Flea and Lice infestation on Dogs . 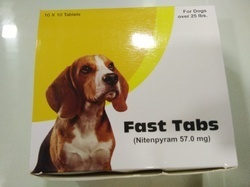 Use only on dogs 7 weeks and older . Do not apply to puppies or dogs weighing less than 55 lbs . Do not use on other animals . Use only on dogs 7 weeks and older . Do not apply on puppies or dogs weighing less than 21 lbs . Do not use on other animal. 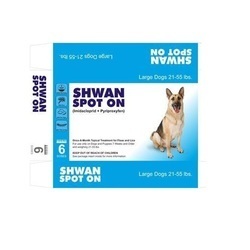 For prevention and treatment of Flea and lice infestation on dogs . Treats , control and prevents lice infestations . 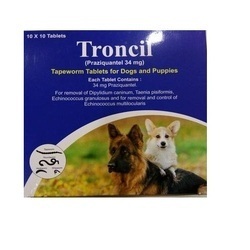 To prevent Heartworm Disease and Flea Population in Dogs and Puppies . To ensure adequate absorption, always administer Shwan Miluf Plus Flavor tabs to dogs immediately after or in conjunction with a normal meal. Shwan Miluf Plus Flavor tabs must be administered monthly, preferably on the same date each month. Treatment with Shwan Miluf Plus Flavor Tabs may begin at any time of year. In geographical areas where mosquitoes and fleas are seasonal, the treatment schedule should begin one month prior to the expected onset and should continue until the end of mosquito and flea season. In areas with year-round infestations, treatment should continue through the entire year without interruption. To ensure adequate absorption , always administer Shwan Miluf Plus Flavor tabs to dogs immediately after or in conjunction with a normal meal . Shwan Miluf Plus Flavor tabs must be administered monthly , preferably on the same date each month . Treatment with Shwan Miluf Plus Flavor Tabs may begin at any time of year . In geographical areas where mosquitoes and fleas are seasonal , the treatment schedule should begin one month prior to the expected onset and should continue until the end of mosquito and flea season . In areas with year round infestations , treatment should continue through the entire year without interruption . We are leading manufacturer and exporter of Broiler Growth Promoter and our product is made up of good quality. 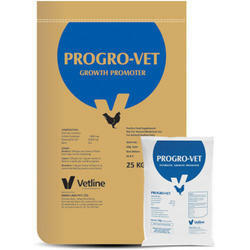 Looking for Pet Health Products ?